Handmade cotton rag paper rsvp card. Paper is dyed with real leaves in a lovely, unique pattern. Prints laser or inkjet beautifully if you choose to print your own. Comes with 100% postconsumer recycled (heavy) paper envelope. ***NOT AVAILABLE*** Unfortunately, the leaf pattern did not take this spring. The spring season was too short, and the chlorophyll in the leaves did not leave an impression. We re very disappointed! Very Modern Eco Invitation: Booklet style, with side pocket and facing interior invitation pages. Clean and rich invitation with a leaf embossed wrapper. Wrapper has an natural deckled-edge. 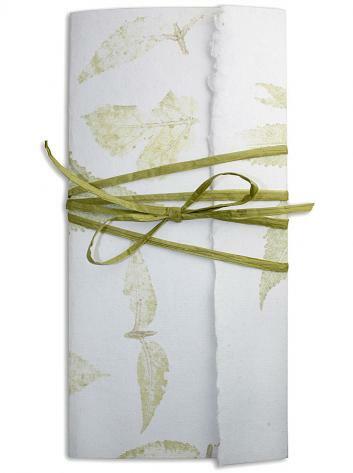 The wrapper is a handmade cotton rag paper that is embossed and imprinted by real leaves. (which are laid onto the paper during the drying phase of papermaking). Each wrapper is slightly different pattern. Invitation is printed on handmade silk and cotton rag handmade paper. Closes with a natural paper raffia tie. Wrapper is scored and the holes diecut for easy assembly. PAPER FACTS: Leaf Wrapper sheet is 100% handmade cotton rag paper, made in India. (diecut in Pasadena) Interior sheet is made from 100% recycled cotton rag and silk, also handmade in India. All materials are made from recycled cloth from the garment industry. Recycled rag was the traditional material for paper since paper was invented, 2000 years ago. Envelopes are 100% postconsumer recycled paper, made in USA and/or Canada. Invitation Sheet: White silk and cotton rag printing sheet. Prints inkjet or laser beautifully. Outer envelope: Milkweed 100% post consumer recycled with flap at top. Wrapper: Handmade leaf paper with one natural deckled edge. We score fold-marks into the wrapper for easy assembly.